Meet Shaun, a fellow Jump Pilot that I met a few years ago when I was hired to ferry a Caravan from Georgia to Illinois and then to Colorado. I am honored to have introduced him to the Caravan on that trip. He learned the airplane faster than anyone that I have ever taught. He now flies a Honeywell powered Grand Caravan for Skydive Santa Barbara. The perfect airplane for flying skydivers up to 13,000 and even 18,000 feet! I love the Caravan because it is a very well built airplane. It's durable, easy on the controls, and it's a work horse. The Garret TPE- 331 conversion (Texas Turbines) makes it a fast and efficient aircraft, especially for skydiving operations. Even though it is a single engine it feels very safe and has an outstanding glide ratio in engine out operations. All in all the Caravan is one of my favorite aircraft to fly. To be perfectly honest I don't have a set path in aviation. I've never had one ultimate goal. Instead, I focus on the enjoyment of flying and the realization of how blessed I am to be able to do what I love. I do know I am going to stay away from the airlines for the short term at least. I've always been attracted to the "odd ball" jobs in aviation, like being a Jump Pilot and Air Attack, all the non mainstream forms of flying. Some would say the "skill gigs". Really though, I just want to make sure I'm always having fun and continue to love flying. What is your advice to younger pilots? My advice to younger newer pilots is to keep a positive attitude towards flying. There are times where it can seem overwhelming, sometimes you may feel under appreciated. But the key is to maintain a positive outlook. Stick up for yourself but always remember why we do this, why we fly. When you get down and frustrated, take a deep breath, relax every muscle in your body and take a look outside your cockpit. Look and see how beautiful flying is. Remind yourself of why you love to fly. In Europe a Class Rating is required to fly the Cessna Caravan. IAS of Germany can help you acquire this important rating. Cessna Caravan D-FUNK is available as a training aircraft with an approved training program according to EASA.FCL for pilots who would like to get the class rating CessnaSET (Cessna Single Engine Turbine). In cooperation with ATO Ardex, Kyritz (DE.ATO.039) IAS has now received the training certification for the class rating CessnaSET on their Cessna 208 Caravan D-FUNK by the German Federal Aviation Authority Luftfahrtbundesamt (LBA). For the class rating CessnaSET, IAS offers a very competitive package price. The training is accompanied by highly experienced and highly qualified instructors (CRI) and examiners (CRE). The training for CessnaSET Class Rating consists of 25 hours of theory and 8 hours of flight time. Please rate about 4 to 6 days (weather permitting) for the entire training. 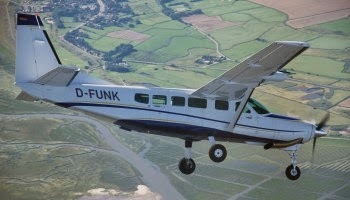 Also, IAS can now offer the Caravan D-FUNK for your next check flights. Two by LBA approved class rating examiners are available for your proficiency check in accordance with JAR-FCL. Recently I was contacted by CJCD Moose FM in Yellowknife Canada and was informed that "they had an incident in the area involving a Caravan making a forced landing on a frozen lake in bad weather." The radio station also wanted me to comment on the "Caravan's capabilities, and describe how difficult it would be to pull off a task like landing on a frozen lake." Obviously the Caravan is more than capable of landing on non-standard runways and even in off runway situations. However, that is not what needs to be asked here. The much more important question is, why did this airplane take off with a freezing drizzle warning in effect for the Yellowknife area? I will refrain from belittling the pilot and simply use this incident as a learning lesson for my fellow Caravan pilots. Especially since we do not know all of the facts pertaining to this recent situation. Here is what we do know according to Transport Canada. On Thursday November 20th at 6:44 AM an Air Tindi C208B Grand Caravan (C-FKAY) departed Yellowknife airport NT for Fort Simpson airport NT with a pilot and 5 passengers on board. 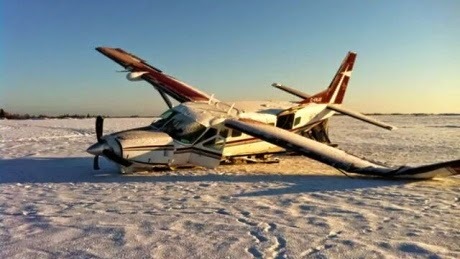 Approximately 22 minutes later the pilot requested clearance to return to Yellowknife airport due to icing. Approximately 13 minutes later and 1 minute before landing on a frozen lake, the pilot made a distress call due to severe icing. The Caravan suffered substantial damage to its left main landing gear and its left wing. There were no serious injuries reported. A spokesman for Yellowknife RCMP, Cpl. Todd Scaplen stated that "3 helicopters waited hours Thursday for the weather to improve enough for them to take off to help the Cessna's passengers." Was that fact #3 that it was too icy for the Caravan to depart? According to Jock Williams, a safety officer with Transport Canada, "pilots aren't suppose to take off in icy conditions and they have an obligation to check the weather." He went on to say that "We simply stay on the ground when we're faced with those circumstances, because no aircraft is certified to handle it [heavy icing] or capable of handling it." In 2006 the NTSB released recommendations that the Caravan should not be flown in anything greater than light icing. Flying into freezing drizzle (which is what the reported conditions were at the time) can definitely cause greater than light icing to form on your airplane, as experienced by the Air Tindi pilot in Yellowknife Canada. If you are a Caravan pilot, I highly recommend that you complete some of Cessna's E-Learning courses on this topic. Courses such as "Caravan Cold Weather Ops" and "Caravan Vodcast Ground Icing Conditions". There are many other interesting courses available, most of which are free and are all available at cessnaelearning.com. I am not aware if this pilot was pressured to depart into a dangerous situation but I know for a fact that it happens, and it happens more often than you would like to know. If you are ever pressured to fly when you know that it is not safe, it's time for you to start looking for another employer... immediately!